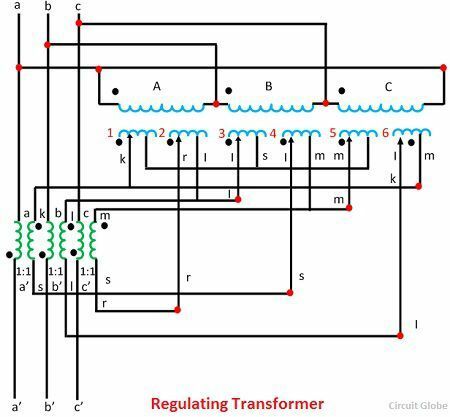 Definition: The transformer which changes the magnitude and phase angle at the certain point in the power system is known as the regulating transformer. It is mainly used for controlling the magnitude of bus voltage and for controlling the power flow, which is controlled by the phase angle of the transformer. They provide the small component of voltage between the line or phase voltage. The main function of the regulating transformer is to control the magnitude of voltage and power flow of the transmission line.The regulating transformer is of two types. One is used for changing the magnitude of voltage which is called online tap changing transformer and the other is called phase shifting transformer. The regulating transformer compensates the fluctuation of voltage and current. 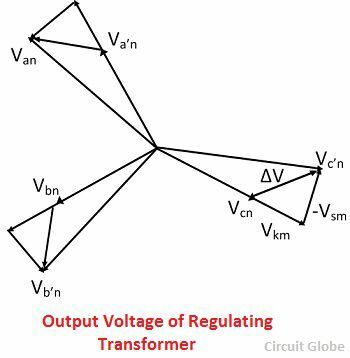 The arrangement of the regulating transformer is shown in the figure below. The main application of power system is to reduce the circulating current and minimise the losses in the power system. The regulating transformer reduces the losses in the power system network, and it also controls the unwanted exchange of the reactive power in the system. The magnitude of Vm can be controlled in a small range. It is used for adjusting the three phase voltage Va, Vb, and Vc. The voltage of the tertiary winding is given below. The magnitude of VΦ is adjustable and is used for control of the phase angle of the voltage Va’, Vb’ and Vc’. The phasor diagram of the voltage is shown in the figure above.